Home › Native Remedies - MindSoothe JR. Native Remedies - MindSoothe JR.
One Bottle MindSoothe JR, 60 ml. BUY TWO, GET ONE FREE. Order two bottles and we will ship three at NO additional cost! All children can feel a little insecure and may worry about certain issues in their personal worlds. In fact, worry is a routine emotion at particular developmental stages for children. Some children's emotions can go through ups and downs in the normal course of events. Common mood swings and worries over imaginary monsters, emotional children who fret about the opinion of other kids at school, and the teenager who refuses to turn down music volumes, often present concerns to their parents. Similarly, children and teenagers who act out due to age-related emotional upheavals and life circumstances can cause untold frictions within the family dynamic. If your child has a problem overcoming worry and you suspect child depression or teen depression, seek the advice of your doctor or psychologist. Teen depression and child depression are a serious condition that should be treated and carefully monitored by a licensed professional. The demands faced by children in today’s world make it all the more important to help them to maintain emotional and mental health and to bring them up in a secure and loving environment. Whether or not children are born with a pre-disposition for worry, even a well-equipped child may battle child emotions and inner struggles due to life circumstance. Also, children may not voice their concerns – or have the vocabulary to do so – meaning that mood swings could be the medium for expression of their emotions. Growing up should be a natural process and worry free! Natural remedies have been used in traditional medicine for thousands of years to gently and safely support the healthy functioning of the brain and nervous system, helping to encourage a normal and efficient balance of children's emotions. In more recent times, research has confirmed this traditional wisdom. There are now many published clinical studies demonstrating the ability of a range of herbs to act in a supportive capacity to support balanced mood and feelings of calm and well-being (e.g. Cauffield JS, Forbes HJ. ‘Dietary supplements used in the treatment of depression, anxiety, and sleep disorders’. Lippincotts Prim Care Pract. 1999; 3(3):290-304. and Hubner, WD. & Kirster, T. Experience with St John's Wort (Hypericum perforatum) in children under 12 years with symptoms of depression and psycho-vegetative disturbances. Phytother Res. 2001 Jun; 15(4):367-70). MindSoothe Jr. is a 100% safe, non-addictive, natural herbal remedy, especially formulated by a Clinical Psychologist for children’s emotions. MindSoothe Jr. supports the brain’s natural ability to regulate mental and emotional health in children – maintaining production of essential brain hormones and chemicals related to nervous system health and emotional well-being, thereby helping to support balanced mood and behavior. MindSoothe Jr. may been used to safely support healthy children's emotions, well-being and naturally support health and systemic balance in the brain and nervous system - without any harmful side effects or risk of addiction. Instead of the capsules used in the adult formula, MindSoothe Jr. comes in convenient and easy to administer drop form – making it simple to adjust dosage for different age groups. The formula remains true to the whole spectrum method of herbal extraction, ensuring the bio-availability and balance of all the active ingredients contained in the remedy. This method of manufacture maintains all active ingredients in perfect balance – exactly as nature intended! How has MindSoothe Jr. helped others? Native Remedies' products are created using our set of standards and processes that combines the best quality, laboratory-tested, raw ingredients, good manufacturing practices and a Full Spectrum manufacturing method to guarantee you products of the highest quality, safety and effectiveness. 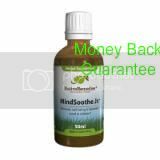 MindSoothe Jr. is a 100% herbal formula that contains the following two therapeutically proven herbs in correct child dosage. The proportion of these herbs in the remedy has been carefully calculated to ensure therapeutic dosage and maximum effectiveness for children. Passion Flower (Passiflora incarnata) has been used to naturally maintain a positive demeanor and balanced children’s emotions – with no harmful side effects! It can also be used to settle the nerves and ease minor worries, supporting mental and emotional health in children. Once again, clinical research confirms natural traditional wisdom. (Akhondzadeh S, Naghavi HR, Vazirian M, Shayeganpour A, Rashidi H, Khani M. ‘Passionflower in the treatment of generalized anxiety: a pilot double-blind randomized controlled trial with oxazepam’. J Clin Pharm Ther. 2001; 26(5):369-373). Contains less than 1% pure pharmaceutical grade ethanol, a natural preservative, when diluted as directed. How do I use MindSoothe Jr.? Use one drop per year of age of the child twice daily (dilute in 25 - 50 ml or about 1/4 glass water or juice). MindSoothe Jr. can be used by children older than 4 years old. Children over the age of 12 years may want to try our adult Mindsoothe formula, while those younger than 4 will benefit from Triple Complex Mood Tonic. Never discontinue prescription medication without first consulting your doctor or a health care professional who is experienced in natural medicine. Do not use MindSoothe Jr. together with other prescription anti-depressants. If your child is very fair in complexion, use a sun block when there is excessive exposure to sun - St John's Wort can sometimes increase the skin's sensitivity to sunburn. With regular use, support is usually noted within 3 – 5 weeks, although some children can respond even earlier. It is important that MindSoothe Jr. be taken regularly in order to enhance and maintain the overall therapeutic effect. A minimum treatment period of 6 months is recommended to ensure continued effectiveness. One bottle of MindSoothe Jr. will last 30-45 days.